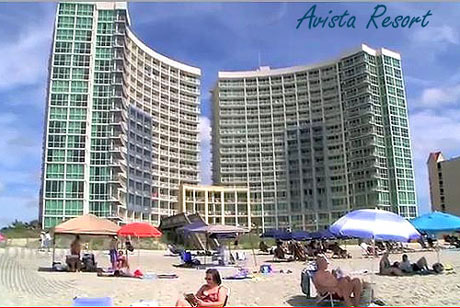 Prestigious North Myrtle Beach is home to the area’s most exclusive, new resort condominium complex, the Avista Resort. The Avista Resort, which offers all the comforts, amenities and features of a full-service resort, boasts a stunning modern look, a dramatic architectural style and an art deco flair. Read more about Avista Resort real estate. Spacious one, two and three bedroom condominiums are found throughout the two, 16-story, ocean front buildings which dramatically arc toward the Atlantic Ocean.An awe-inspiring, five-story centerpiece connects the two buildings and provides direct access to the on-site convention center, restaurant, lounge and fitness center. Phase I, commonly referred to as the South Tower, includes 145 oceanfront units and 58 ocean view units. Phase II, commonly referred to the North Tower, includes 145 oceanfront units and 39 ocean view units. Each unit is designed to “fan out” from the its curved, private balcony, thereby creating an exciting and dramatic architectural effect, as well as stunning views of the Atlantic Ocean, making each unit an excellent Myrtle Beach Real Estate investment. Just some of the features of the Avista Resort include varied floor plans, fully furnished and designed interiors, fully appointed kitchens with refrigerators, microwaves and ovens, tiled entries, kitchens and bathrooms and central heating and air conditioning.Units in the Avista Resort range from 497 square feet to 1,446 square feet. The resort-style amenities of the Avista Resort include a bell stand/porter service, daily housekeeping, a 24-hour front desk, a state-of-the-art fitness center, private, covered parking, wireless Internet access, a full-service restaurant, a poolside grill, a treetop lounge and in-room dining. 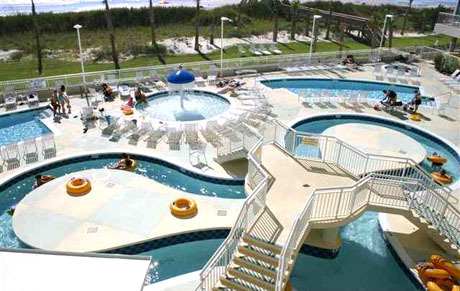 In addition to its direct beach access, the Avista Resort is home to many, year-round water amenities, including pools, children’s pool, spas and lazy rivers. Located near an exclusive, residential area, the Avista Resort was granted a Planned Unit Development (PUD) zoning designation by the city of North Myrtle Beach. Building was completed in 2005. The Avista Resort, because of its outstanding amenities and ideal location, makes it the perfect spot for golf getaways, business conventions, family vacations and romantic retreats.